The most renowned attraction in Hangzhou, West Lake draws tourists from all corners of China and the world for their China travel deals. Surrounded by mountains and stunning foliage, and one of the newest UNESCO World Heritage Sites (it received the designation in 2011), the lake grounds are speckled with temples, pagodas and gardens renowned throughout the world. But while the big features hog all the glory -- Broken Bridge is justly featured in a few zillion photo albums -- the real charm of West Lake is found in its neglected nooks and crannies. By following this itinerary, you’ll catch the best attractions, as well as other worthwhile discoveries that many guides and most visitors miss. First stop is the five-story, octagonal emblem of West Lake. Built in 975 of brick and wood, Leifeng Pagoda is known throughout China as the location of the folk tale “The Legend of the White Snake,” a love story about a snake who is transformed into a woman and then locked up beneath Leifeng Pagoda by a monk. 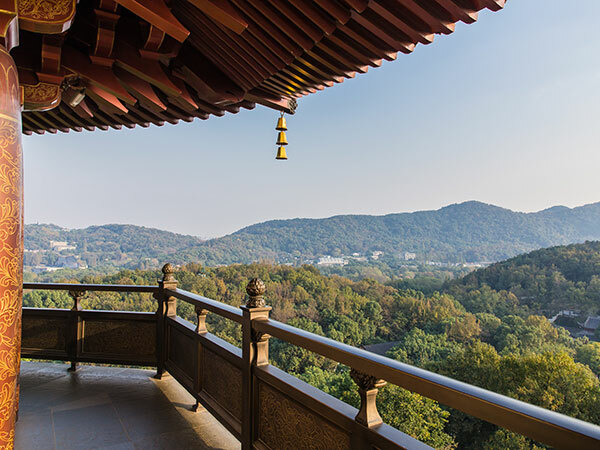 Inside the pagoda is a recently excavated mausoleum, with treasures including Buddhist silk scriptures, hand-carved, wooden dioramas of an epic myth of West Lake (a destination for top 10 China tour packages), and, of course, sweeping views of the lake. You can climb to the top or take an elevator. After lingering around the Leifeng grounds, head east on Beishan Lu to the Temple of General Yue Fei. The expertly manicured grounds were built for the renowned Song military commander. Betrayed and executed, he was posthumously pardoned and reburied at this site in the mid 12th century. In front of his tomb lie bronze statues of his betrayers, whom pilgrims and tourists have been vindictively spitting upon for hundreds of years. From the Temple of General Yue Fei, head east on Beishan Lu past the opulent Shangri-La Hotel. The thousand-year-old Baochu Pagoda will tower above you. The marvel of this site lies in the lush ascent to the top of Precious Stone Hill. On the way up are secluded teahouses and odd rock formations. The hilltop affords spectacular panoramas of the entire city and West Lake. So you can climb the top of the pagoda for your popular China tours. Upon descending the hill back onto Beishan Lu, the most famous bridge in Hangzhou is literally right in front of you. No, it's not really broken. It just appears that way when covered in snow, with its humped arches sticking up from the lake. Though you may bump shoulders with the visiting crowds, the walk toward the largest island in the lake is pretty and relaxing. Here you'll find several museums, parks, nature trails, Louwailou (the illustrious Hangzhou-style eatery) and, of course, a Costa Coffee, housed in a Qing-era-style villa. After getting your fill of the quaint, the ancient and the must-see, move onto modern-day fun -- food, nightlife and shopping. Head southeast along the lake to reach the bustling Hubin Lu shopping district. Here you’ll find everything from Thai, Italian, Japanese and hotpot restaurants, to Gucci, DKNY, Armani and Hermès buys, to five-star hotels, noisy nightclubs, crazy KTVs (Chinese karaoke) and a seizure-inducing light-and-water show. After your tired China tours, you can relax on this street. The show is presented across from the Hyatt Regency Hangzhou every 30 minutes from 6 p.m.-8 p.m. on weekdays, and 6 p.m.-8:30 p.m. on weekends. Additional shows may be added during holidays. If you can't find something to do here, you might be more comfortable in a Buddhist convent. Officially, swimming in West Lake is illegal and does not exist. Nor do bicycle thieves and pollution. But taking a night swim in West Lake is rumored to be a local pastimes among more daring types. Shrouded in urban myth, these cool dips supposedly take place in some secret, secret location on the west end of the lake off Yanggongdi. Others say the spot is near Qingbo Jie, between Nanshan Lu's two sumptuous Indian restaurants. But night swimming does not exist. Nor do we condone such random acts of roguery. Never, ever. For more, you can consider it for your China travel packages.